Hi All - I am Paul a male at the age of 33 from the Netherlands. I am working in a relatively fast-paced job. Altough I am half Indonesian (mother 100% Indonesian / Father 100% Dutch) years back I totally fell in love with the Japanese kitchen, culture and country. I love cooking Japanese myself and after stumbling across the Bento Box I decided to extend this to my lunch as well. I am traveling a lot (national and international) and decided that the Bento Box fits in perfectly to enjoy my lunch regardless of the geographical location. Well deciding to go for the Bento Box was the easy part, getting a proper Bento Box (not for it's size but for its looks) proofed to be a journey in itself. But it was most defenitely worthwile because along the way I came across some interesting websites of which this one stands out. Is it just me or aren't there much men out there who included the Bento Box in their daily routine? As I included it in my routine I get nothing but interested and positive feedback from co-workers and even clients I visit as I work from their location. Including the Bento Box in my routine also introduced this wonderfull timeslot in my otherwise hectic schedule wherein I totally relax, enjoy healthy food with pure flavours and recharge to take on the second half of my day. I have enjoyed recipes from this site and it would be my privilege to contribute by giving back to the community. But they're still rather nice. I am a 43 year old male from Austin, Texas and a learning but avid bento box maker. I have a son that is getting ready to start kindergarden, and I pack bento lunches for him each day. I enjoy the creative outlet, and he enjoys the food. His bento boxes consistently come home empty at the end of the day. I can relate to the lack of masculine bento boxes, although it is not a huge challenge for my son. He is still young enough that the cute boxes work great for him. As to myself, I rarely pack my lunch and use generic plastic storage containers when I do. That's a great looking bento! Your son must really love them! Just catching up on the forums and wanted to let you know - in MUJI stores around London there are great plain white or black bento boxes in approx 900ml sizes, good for men who want a plain and non-girlie bento. They also do matching chopsticks and cases. I've seen them most recently in the MUJI next to Covent Garden tube. The Japan Centre have also now started selling a black two-tier box (small pattern but NOT girlie) and those plain beige "onigiri" boxes (triangular etc). Hope you can find something your husband likes! I am 100% dutch, male, moved to Canada 51 year ago. I amke Bento lunches several times a week for lunch at a part time job. My wife and I split the cooking duties (so that we both get kitchen time) but I do Japanese & Indonesian while she does other cuisines. Makes for fabulous food and lots of variety. Hi Paul, and welcome to the forums! I guess not that many male bento lovers have surfaced as of yet, but there is certainly interest out there. I think we have a number of male readers of this site. There's a site called A Man's Bento (not updated recently, unfortunately) which has a lot of 'manly' (as in not-cute and hearty) bentos. In Japan, there's increasing interest in bentos made for and by men, and a number of new bento books out on the subject too, partly due to the economy and all. Also, I try to make all the recipes and bento examples here pretty gender-nonspecific (with the occasional lapse into cuteness) since bentos are for everyone! Why should men's Bento have to be "manly" ?? On the flipside, I'm female and don't feel obligated to have a 'girlie' bento, nor one that is necesarily cute or 'fun' or particularly interesting looking to anyone not actually eating it. I'm not sure I could agree that Bento History involved making it fun and interesting - I suspect that this is a relatively recent phenomena, particularly with boxes meant for children, and only covers a fraction of the bento produced on a daily basis. Admittedly, I picked up some boiled egg shapers from a 100yen store and some gadgets to punch out faces from nori on my last trip to Japan, but that's because I have a baby on the way, I haven't used either device so far. 'Cute' bentos are a real novelty for me, and a phenomenon that whilst I find very interesting, isn't something I can truly engage with. I love the pragmatic challenges of Bento, and I believe most of the History of Bento involved ways of tackling the challenges, which are mostly to do with the practicalities of transporting food conveniently and maintaining its appearance, taste and texture (and freshness) so that it is appetising to eat. Wealth and the ability to travel long distances quickly allowed an ingrained love of novelty to creep into the Bento and local specialties from all over Japan became better known when visitors who were passing through the area experienced them for the first time as part of a Bento meal. I guess this is a drive for me too - a new recipe or flavour as part of Bento gets my appetite whetted much more than a beautifully carved radish piece. I'm personally very glad that Maki makes mostly neutral Bento. Though mine is with a dark blue cover and I have a set from a small round I'm guess 150mL through the square 200mL up to a big 1.8L square. I use the small ones for things like parmesan or sweet chili sauce and use the now the 960mL one as my main Bento box. This discussion amuses me because the first time I ever heard of or saw a bento box, at a restaurant in NYC, the waiter cocked an eyebrow at my tiny dining companion when she ordered it and asked her if she was sure she wanted it, "Because it's so big!" he explained when she asked why she wouldn't want it. And it was. It has become our gold standard of bento and if we come up with a girly or stingy one now we always think of our tough and manly little waiter at Takahachi and his big bento box, wondering if he would approve. My husband likes bento, although we're not very fancy. We have a Mr. Bento and a couple of two-layer tupperware-type things we use for bento; the food inside is usually tasty rather than pretty (or tasty and pretty). Sometimes we each make our own, sometimes I make them for both of us, sometimes he makes them for both of us. He gets a little bit teased at work about his wife making his lunch, but mostly everyone's jealous. He's 32 and we live in Illinois in the US, in a smaller city. I think it is enough work already on cooking and prepairing them... not to mention to split them into 'man' and 'girl' bentos! I don't particularly like kyaraben... I mean all those colours are not usually natural. I prefer healthy food, even if it's less attractive. You can have a cute bento sometimes... but honestly it's way too much work to wake up early to cut carrots in cute ways. Even if it only takes you a minute to do it, it's a minute you could spend sleeping! I mean they are carrots anyway. They'll end up in your stomach, cute or not. I prefer to use boxes that do not have cartoon themes or bubble gum colors. Masculine, industrial, or military appearance is my personal preference. One of my new favorites is a box made by SIGG, the company that makes the water/fuel bottles for outdoor applications. This box comes in two sizes - Maxi and Midi. The Midi size is about the size of a normal bento box. They are aluminum, anodized in several colors and the interior is coated in some type of food-safe coating. As they are metal, they are NOT microwaveable. I have found stainless steel boxes in stores that sell Indian food and kitchen things and some of these are quite nice. Most however do not seal well. There is a historic US Army interlocking skillet/bowl mess kit that I have used and enjoy, here again, it does not seal well. Recently I got a box from Pellican, a maker of waterproof boxes for camera/cell phones/GPS... It is about the right size, kind of deep-ish, has an excellent seal. I ran it through the dishwasher and then filled it with baking soda for a few days to get out the plastic smell. This box seals great and is tough. I have some skewering techniques that involve stainless steel bolts -- perhaps I need to work up some photos of these. Anyone with similar preferences got any other suggestions? I love the discussions, everybody's input into "manly bentos" is very interesting. I cook bentos for my husband (who is Japanese) every day. When we started we spend some time looking for an appropriate box and we decided to get a plain white rectangular box with clear cover 1000ml and 3 dividers inside. I cook anything from really cute to plain leftovers, depending on my mood and on what I have in the fridge. On occasion, I will cut up the carrots in shapes, which I think brightens up the bento and makes it more aesthetic rather. My husband loves them and often gets envied by his coworkers. So I think you should be able to get a plain box if you want to keep it simple and fill it with what you want to have for lunch, what will make you happy, whether it's a cute bento or a simple meal. Hi Paul, good to see more dutchy's here. And you've started quite a discussion as well.... like it matters wat gender you are, we all gotta eat, don't we? And in the end, Bento is just a lunch in a box, isn't it? (just like bonsai just means "tree in a pot", I've had quite some discussions on that matter: but it's just a small oaktree! Yes, that's the whole point of it :)). 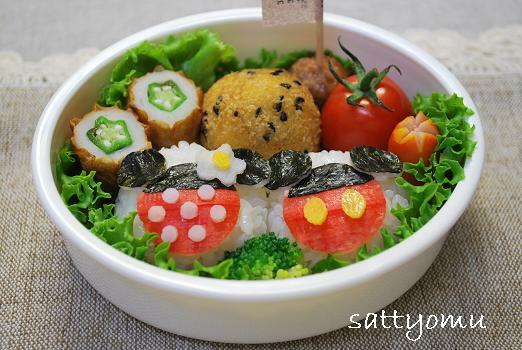 Anyway, just enjoy your bento's, whatever they may look like! Yeah I'm a guy and I make my own bento meals. On the whole I'm guessing most men are neither as tidy nor as detail oriented as your typical woman, and I include myself in that, but I do a workman-like job- maybe a little repeditive to call myself a true bento enthusiast. I'm the main consumer too, and in addition to the above that further detracts from the desire for cuteness of preparation. But the eating, that's all good, and this site is invaluable for tips on the subject! You said that you wanted to see the bolted skewers. I posted a photo on the flickr - just bento, today. I want to see them too, and I can't find them. Can you post a link here? I am not 100% sure what I did for the ones pictured. Carrots, red peppers, onions for sure, may have used some bacon or pancetta (I am a recovering vegetarian...) Brushed on a little sesame oil and soy, threw them on the grill. Perhaps I should go into a little more detail. Like I mentioned, the tricky part is the pre-punching of the holes. I found some small tubing at my local hardware. One size is perfect for holes for 1/4" (5 or 6 mm would be a good starting place for metric sizes) and the other size that I use is larger - 1/2" (10mm). Since you have to clean out the tubes during punching the veggies the two sizes I mention are useful since you can clean them out with a bamboo skewer or a chop stick for the larger size. Stainless washers are also a nice touch. I have been hoping to find some stainless "all thread" and use wing nuts on each end - I like the functionality of the all thread and I bet I can find it in longer lengths. In other parts of the world the tubing may be available in hobby stores. These stainless skewers, besides being fun, are rather practical since they don'd require soaking like wood, are dishwasher safe. For cooking, I wouldn't use brass or anything besides stainless since some non-stainless bolts are plated with zinc-chromate or even cadmium (Toxic!) Brass tubing for the punch however, is probably OK. I think what's needed is some good long self-tapping screws. Then you could just thread the food onto them. I agree, why "pre-drill" when you don't have to. I have seen very long screws with a tapered end (says the woman that likes her wood and metalworking tools more than most men). Something we have in common Stephanie! The difficulty will be in finding them in stainless steel. You can't imagine the hassle I had getting something resembling a cup hook in stainless. I have not had much use for a cup hook, so I can honestly say I have not looked. If you make friends at the hardware store, they will usually order what you need. Or here is always online, with just a quick search I was able to find a number of vendors that sell them in a variety of sizes. I can always get stainless things via my friend Henry, who is a stainless steel fabricator. It's just a hassle, because he lives in the North Island and I live in the South Island and it means he has to bundle things up and post them. Much easier to be able to go to a shop and buy them and take them home right now. The only places that seem to have much in the way of stainless fittings are marine suppliers, and it all depends on what they happen to have in stock. Via Henry is cheaper, however, and with stainless that is always a big bonus. The average male would probably need a larger box than that, though. I'm Dutch and we've been searching for a nice box for my husband, one without Hello Kitty. Just this Saturday we came across one at the department store Hema! Just for 15 euro's and it was sold as a lunch box with 4 compartments. I don't think it's weird for men to make bentos or have fun lunch boxes. I have to say how much I admire all of you men who are preparing bento for yourselves and your loved ones. You are eating healthy, saving money, and exercising a creative outlet. Ditto! Please please get your husband to take photos.